I bought a new laptop last fall, which I think would be morethan just a laptop. Cue Microsoft’s Back to School sale, where Surfaces and Xboxes were bundled together in one convenient package. Throw in a couple of discounts and, as somebody who was looking for a laptop and suddenly another console, I found myself the new owner of an Xbox One and a Surface Book. Other than little light sketching and Photoshopping from time to time, I’ve wondered whether the Surface Book was really meant for somebody like me. I’ve come to the conclusion that it surely isn’t, but nonetheless I’ve stuck with it. I’ve even forced myself to use it more often because of just how much I spent on this laptop. It was a particularly pained purchase once I realized that a Chromebook would suffice for a good 80% of what I do on a daily basis. Yet, here I am, typing this article on my Surface Book at this very moment because I’m committed now. There’s a lot of talk of a Surface Book 2 showing up soon, perhaps at the end of either March or April. Surface Books and Surface Pros are on sale in the Microsoft Store, indicating that a new product release may be on the way. Rumors and leaks have also been making the rounds, and some of them are a little concerning, particularly the one that suggests Microsoft will make the second generation Surface Book a regular clamshell laptop rather than a 2-in-1 hybrid. Even as somebody who doesn’t necessarily milk the Surface Book for all its worth, I find myself hoping that isn’t the case; the Surface Book’s unique design is what causes me to keep it rather than sell it. It’s an odd device, I’ll give it that, but its quirky design works in a lot of ways. I’ve owned 2-in-1 laptops before, but they’ve always folded backwards, leaving the keyboard exposed and touching whatever happens to be underneath it. It’s a weird, vulnerable feeling. Yet, the Surface Book’s ability to detach, flip around, and reattach (which safeguards the keyboard with the back side of the screen) make the flipped screen a much more pleasurable experience. It’s nice to not have to worry about an exposed keyboard. Then, of course, you have the Surface Pen. I love it. The fact that I haven’t lost it once is a miracle, because I lose everything. The magnet on the side of the device is strong, and it’s become a habit for me to place the Pen there when I’m not using it. It would be weird if it wasn’t there clinging for dear life on the side of my screen. Best of all, I don’t have to worry about charging it. Oh, and it writes well, too. The hinge itself is also exciting, for lack of a better term. The “dynamic fulcrum hinge” gives it a really solid feel. It’s even enjoyable to hold when toting it around. It does have its drawbacks; I’ve been pinched a time or two when opening it, and the hinge doesn’t tilt back to what I would consider a “comfortable” angle when using on a lap. There’s also a lot of discussion regarding the Surface Book’s electronic attach/detach mechanism, as it can only work when the device is powered on. Ultimately, that is a drawback, but in my experience, I haven’t had a need to attach or detach the device while it’s off; it would just be comforting to know that I could. The Surface Book’s screen is also a weakness in two notable ways: it’s top heavy, and it’s not entirely useful without its base, which is a shame. While you can use the Surface Book’s screen without the base, the battery life only lasts a couple of hours if you’re lucky. As for the heavy screen, well… there’s been more than one occasion where I’ve set the device down while open, and it has managed to topple over under its own weight. Even if I were to take my hands off of the keyboard right now, sitting cross-legged with the Surface Book on my lap, it would tumble onto the floor in seconds. That’s not something I would expect a $1,499 laptop to do. Fortunately, one of the rumors regarding the Surface Book 2 states that the price will be much lower than the first generation, starting at around $1,000. Whether that’s true or not remains to be seen, of course, but a lower price would reasonably be expected of a device that’s “just” a laptop rather than the hybrid that it currently is. Or perhaps Microsoft realized that a $1,500 asking price is just a little too high to start with. 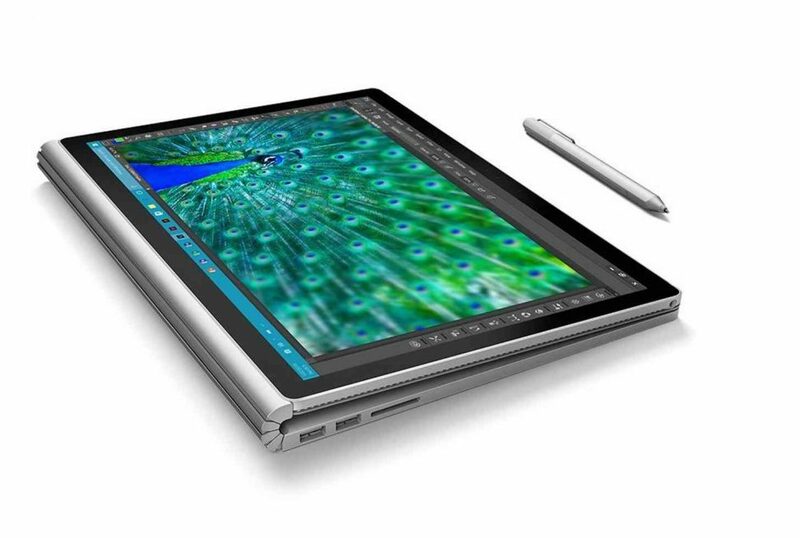 The perfect Surface Book 2, from my perspective, would simply be to make the screen lighter (or at least have a better battery, either works I suppose – both would be ideal), keep the unique hinge and ability to be used in a variety of ways, and lower the price. Also, offering the sale of standalone bases wouldn’t be a bad idea. There has been a time or two where I wished I had purchased a more powerful Surface Book (usually when I get in one of my gaming moods, which isn’t so often anymore), but I am a little surprised to find that you can’t buy individual ends of a Surface Book. Not yet, anyway. I really like the Surface Book. It’s a neat little device. I like that I can use it as a laptop or a tablet, with or without the base. I can take notes on it and sketch with ease. It really is a terrific idea for an all-in-one device, but it could use some tweaks to make it feel like you’re really getting your money’s worth. Hopefully the Surface Book 2 ends up being just that.